Work From Home Job or Home Business: Which Is Right For You? Being a large family on a single income is not an easy thing. Even more so when you homeschool as well. Planning and sacrifice are part of the plan as they are with anything you really want. It is nice however to have the option of extra income when you need it. Not to mention it is smart financially to have multiple sources of income. Life as we know it now gives us so many opportunities to bring in an income from home while being with our kids and still fulfilling our homeschool responsibilities. Because there is so much opportunity out there right now, it can be hard to figure out what is the best option for you and what will work best for your family. A “work from home job” and “home business” frequently get used interchangeably, but there are differences in them. This post will explain what the differences are so you can figure out exactly what it is you are looking for and what will work best to help your family. Work at home jobs are jobs that a company or business pays you to do as an employee (in most cases). A lot of these jobs center around customer service, like responding to emails, tech support, chat support, and phone calls, especially if it is with a big company. Steady Paycheck. Just like at a job you would leave the house to do, you will get a steady paycheck. You will know exactly how much money you will be able to bring in every month and you can count on it. Steady Work. If you are hired for a set number of hours, you will work those hours. Experience. Some employers like to see that you’ve worked from home before, so this will give you the experience you can point to on your resume if you want to change companies later on. Limited flexibility. You will need to work when they tell you to work. On super busy days or days when kids are sick, you would still be expected to work your hours. Depending on the job you might be able to complete the work whenever it works in your schedule, but most will have certain hours that you work. Limited income. You can only earn the amount they pay you. There may not be options such as picking up extra shifts if you needed to create more income. Likewise, even as your skills grow your wage would most likely not reflect that. You are not in control. If you are working for another company or business, you are working at their discretion. If they have slow times or need to lay off employees, there isn’t much you can do about it. You would have to go find another company. With a home business, you are providing a service or product to someone. The number of home businesses you can start is almost limitless. There are so many opportunities now. Let’s take a look at the benefits and drawbacks of a home business. Unlimited Income Potential. Starting a home business means you are only limited income wise by what you can produce. The more you produce the more you make. You also are not limited by a wage, so as your business becomes more in demand you can start charging more. Schedule Flexibility. You have the power to determine when you work. There will, of course, be limits to this based on what kind of home business you start, but you, for the most part, can make it work around your other responsibilities. Go Full-time. Depending on how well your business does you could turn it into a full-time thing. Maybe you want to travel, or your spouse would like a different job or you want to move. A home business could help you do all those things and it can give you options. You have to find your clients. If you want business you have to be willing to go find it. It is unlikely your business will succeed without any kind of marketing effort on your part. Unpredictable Income. While you may have some stability here, it’s not like a regular paycheck. You can have 5 clients one month, 2 the next and then 6 after that. You would have to be willing to find more clients on months where you are low or brainstorm a new way to make money with your business (it’s great for businesses to have multiple streams of income as well). Running a business. If you start a home business, it also means you need to be willing to do all the aspects of a business: marketing, sales, bookkeeping, taxes, operations. Delayed Income. Depending on the business you decide to start, it may take a couple months before you start earning a profit. Most businesses require a heavy time investment on the front end with payment coming later. It’s not true for every business, but think about what you truly need to get started and how long it will take people to know about your business. If you need money today, this may not be the best option. 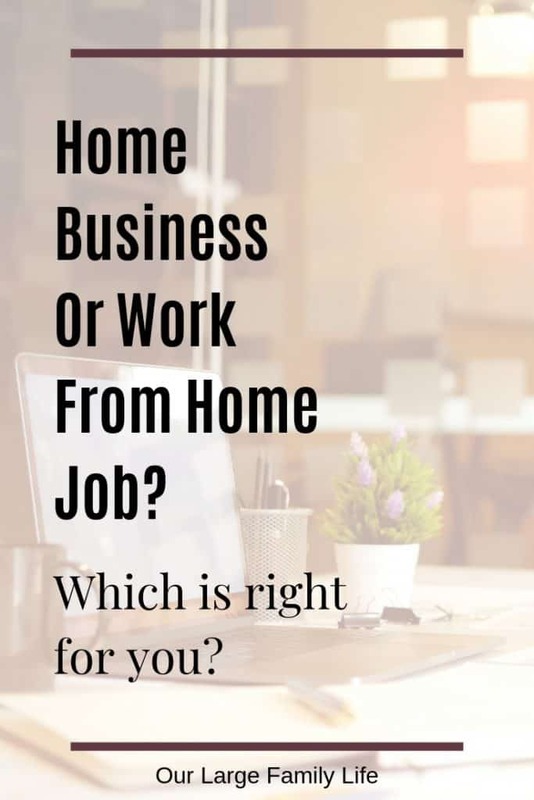 Now that we have discussed the differences between a work from home job and a home business, it’s time for you to decide. Start by taking a look at your schedule and lifestyle and see what could work. Use these questions to get you started. Do you see some time every day that would be free for a work at home job, or is the time you could devote to working different every day? How much money do you need to make to help with your financial goals, whether it is cover monthly bills, paying off debt, or reaching a larger savings goals? Do you need steady and predictable income or can you handle some uncertainty every month? Knowing what works best for you and your family is the first step to successfully work from home. No matter what you choose, both options provide you with the opportunity to make money from home. Which is better for you: work from home job or home business?